If you’re a fan of pulled pork, but are watching your waistline, I recommend this simple recipe for Tangy Pulled Pork, made in the slow cooker, using lean pork loin, and just a few other sauce ingredients, such as ketchup, brown sugar, and apple cider vinegar. In fact, this was my featured Favorite Recipe of February in my post summarizing the best recipes of 2011. 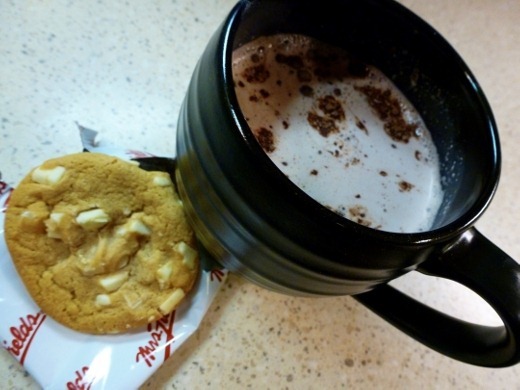 You can find the recipe and details here. 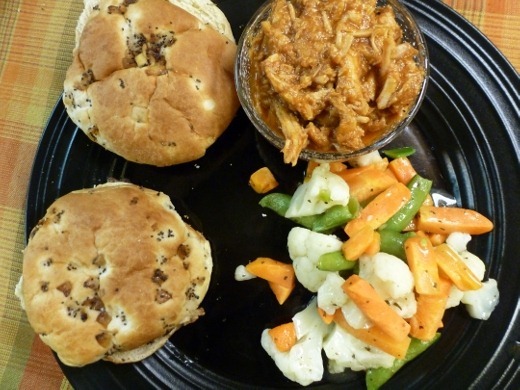 Yes, I serve my pulled pork on the side, and assemble my sandwich just before eating – so my bun doesn’t get soggy! Onion buns are highly recommended as well. 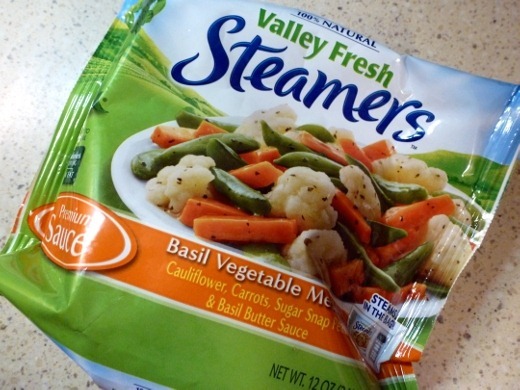 To go with my recent easy crock pot dinner, I heated a bag of Green Giant Valley Fresh Steamers vegetables, which I received as part of the Foodbuzz Tastemaker Program. I loved that I could just place the bag in the microwave and not have to dirty any additional dishes. I also appreciated that the sauce on these veggies was very light, and did not add a high number of calories. Each 3/4 cup portion had only 45 calories. Sometimes veggies found in the frozen section are hidden beneath a highly calorie-laden sauce, leaving the fresh veggie goodness barely discernable. However, that was not the case here; the sauce was light and allowed the veggies to shine. The flavor of the sauce itself was not my favorite. The medley I selected was cauliflower, carrots, and sugar snap peas, in a basil butter sauce, but the sauce didn’t really taste like basil to me. It just was just okay, and had kind of an off-flavor. I wouldn’t pick this flavor again, but I might try some of the other Green Giant Valley Fresh Steamers products, for their ease of preparation and low number of calories.